My cologne? Eau de Bush’s Fried Chicken . . .
A funny thing happened to me on the way to the Forum yesterday. No, belay that—I didn’t mean the Forum—that’s where Julius Caesar was heading when Brutus intercepted him and said, Here, Julius, hold this! and then stabbed him. No, I was on the way home from having lunch at Bush’s Chicken Restaurant in Converse, Texas and a funny thing happened when I stopped at the newly opened 99 Cent Store at Thousand Oaks Drive and Jones Maltsberger in San Antonio. That store was open for a year or so then closed for some reason. The closing saddened me—among many other bargains they sold watermelons for 99 cents, the same brand that the HEB supermarket across the street was selling for prices up to seven dollars. 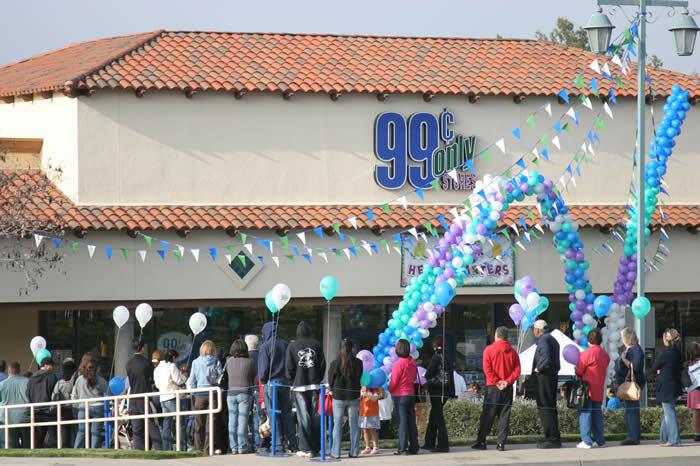 The 99 Cents Store just reopened with lots of fanfare, with grand opening day bargains that included 22-inch flat screen TVs for 99 cents to the first nine people through the door—people began lining up two full days before opening day with picnic chests, coolers and lounge chairs. The store was open two days before the Grand Opening, and I stopped there the day before the Grand Opening. They were closed that day, and a nice lady told me that as I was exiting my car. She and her husband had just been turned away, and she was kind enough to brief me before I made the trek to the front door. The couple were long past the eligibility age for AARP, but I must say for the lady that she retained a keen sense of smell. After she told me the store was closed, she said, Sir, can you tell me the name of your cologne? and I, nonplussed, said Excuse me? She asked me again, saying that she really liked my cologne, that the scent was heavenly and she just wondered what it was called—I suppose she intended to purchase some for her husband, or perhaps for herself—who knows? I use neither cologne nor aftershave lotion—in fact, I do not shave because I have a full beard and mustache. I use deodorant but it’s unscented, as is my bath soap. I answered the lady truthfully, without a hint of laughter, not even a smile. I said, Ma’am, I don’t use cologne. That isn’t cologne you smell—it’s Bush’s fried chicken. My clothes and those of my wife had apparently absorbed the odor of fried chicken, plus we had a take-out box with leftover chicken pieces resting on the pullout drink holder on the dashboard. It was a hot August day with virtually no breeze, and the odor exited the car at the same time I did. This is a true story, certifiably a candidate for Ripley’s Believe it or Not—had my wife not been with me to verify its truth, I don’t believe I would have ever told the story. Veracity is one of my pitifully few positive attributes, one that I strive to attain and maintain in all my conversations with others, whether written or vocal. I freely admit that I boast a lot, a fact that is substantiated by some of my postings on Word Press, but hey—it ain’t bragging if you done it! The lady acknowledged her faux pas gracefully and with laughter, and asked for more information on the source of my heavenly odor. I briefed her on the two locations of Bush’s Chicken Restaurants in the city of Converse and told her that other outlets in the San Antonio area were on the drawing boards. Please don’t tell Bill Miller of Bill Miller’s Restaurants what I told the lady before we parted. 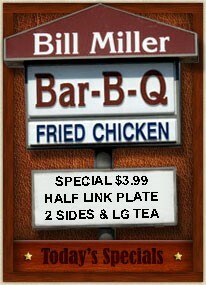 Bill Miller’s is a chain of restaurants that offer fried chicken as a staple along with barbecue and sausage and brisket, tacos, iced tea, and various pies, ubiquitous in San Antonio and with locations in other Texas cities. Some locations, but not all, serve breakfasts, and their tacos are outstanding. When you go, and I know you will, try the potato, egg and cheese taco—it’s great! I told her that Bush’s Chicken Restaurants plan to open more outlets in the San Antonio area and would likely give Bill Miller a run for the money—at least in the fried chicken part of his business.